Biological recording is the observation of the distribution and abundance of animals and plants, the type of habitat in which it is found and the date it is seen. While recording can be carried out just for personal enjoyment, it also adds value and promotes the understanding of the local and national distribution of animals and plants. Observations taken over several years can help to determine the changes in distribution, movements, and whether species numbers are increasing or decreasing. Recording acts as a health check for the environment. This information helps local authorities, planners, conservation organisations and the public monitor the status of species and habitats, and to plan conservation measures that will help maintain and improve a high quality of biodiversity within the Tayside area. We are particularly interested in encouraging recording in the Tayside Biodiversity partnership area of Angus, Dundee and Perth and Kinross. A recent churchyard survey in the Carse of Gowrie has unearthed two species new to Britain. 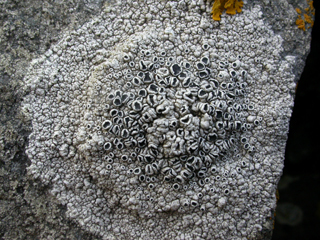 The first was the tiny crustose lichen Lecanora invadens with ‘jam tart’ like spore producing bodies (apothecia). The second was the lichen parasite Sclerococcum tephromelarum found growing on the black shields lichen Tephromela atra. Lichens are part-fungi and part-algae and sometimes have their own specific fungal parasites. Deciphering these species has been a lifetime’s work for the discoverer of the two new species, lichenologist Dr Brian Coppins. He was part of the Scottish Churchyard Lichen Group, led by John Douglass, surveying the churchyards for Perth & Kinross Council.